Almost everybody can appreciate the value of a good bath. The thought alone of a hot bath conjures up notions of comfort and relaxation. However, for many elderly people with decreasing mobility, the bathtub becomes a liability. To seniors and people with mobility issues, falling is the number one cause of injury, and the bathroom is the highest risk area. Many of the falls that occur in the bathroom are related to getting in and out of the bathtub. One recently popularized solution is the advent of the walk-in bathtub. These specially designed tubs have a door for easy access, eliminating the need to step over the high thresholds of regular bathtubs. Walk-in tubs have the option to include extra comfort amenities such as bubble jets and heated seats, along with safety features such as deck extensions which allow helpers to sit by the tub and assist the bather. While walk-in bathtubs remain a viable option it is important to consider all alternatives in order to maximize comfort, safety and value. After considering the advantages and disadvantages of the walk-in bathtub I will introduce the concept of a roll-in shower, which could prove to be a preferable method of safe bathing. The walk-in tub allows for a similar soaking experience to a regular bathtub. They come equipped with safety features such as anti-slip flooring, grab bars and bench seats. Additionally, luxury models are available which include water jets, digital temperature display, thermostatic temperature control valves, extending handheld flex hose and heated seats. Thus, changing to a walk-in tub can be both a safe and luxurious upgrade to your current bathtub. The first disadvantage of the walk-in tub is that it can be an expensive endeavour. Installation fees can be high and it is not uncommon to require a new water heater and water service, as the tubs are often quite large. The size of the tubs may also contribute to larger utility bills. The average bath is reported to use twice as much water as the average shower, making it both lest cost efficient and eco-friendly. The second disadvantage regards the operation of the bathtub. Walk-in bathtubs require you to be in the tub before it starts to fill up and until it is finished draining. This results in you having to wait, cold and impatient, as the tub fills and drains. Even with heated seats this can prove chilly and uncomfortable. Another disadvantage inherent to the walk-in tub is the height of the threshold at the entrance. While the 6”-8” threshold found on walk-in tubs is highly preferable to regular bathtubs, it can still prove to be a safety hazard to those with severe mobility issues. For the seriously infirm it could prove too difficult to get in and out of a walk-in tub. When remodeling your bathroom to make it more accessible, it is important to be aware of all options. In addition to walk-in bathtubs, it can be fast and easy to replace your old bathtub with an accessible walk-in shower. Barrier free showers are low-threshold showers available with a rubber T-Water Stopper to keep water in the pan as it drains. These flexible thresholds allow for shower seats to roll right into the shower, effectively eliminating the danger of falling when entering. Further, having a shower eliminates the uncomfortable waiting time of filling and draining the bathtub. You can wait outside the shower until it reaches optimal temperature. There are also definite cost benefits to opting for an accessible shower. In addition to the money saved on utility bills, the product itself is generally less costly than a bathtub and installation costs are greatly reduced. 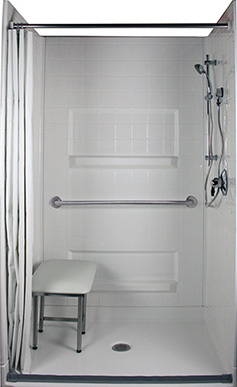 Lastly, a roll-in shower is a lifetime solution to safe accessible bathing. Showers which have plywood backing permit the construction of additional grab bars and seats as your mobility changes. In conclusion, if you are looking to remodel your bathroom to make it more barrier free, it is important to make an informed decision based on what is best for you. Know what your options are and take into account the safety, comfort and financial advantages and disadvantages of your options.